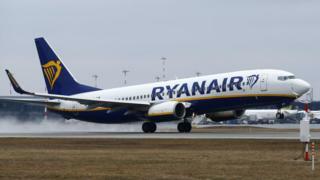 The data said Ryanair's carbon dioxide emissions rose by 6.9% last year, but the firm said it was "Europe's greenest and cleanest airline". In a statement, the carrier added that "passengers travelling on Ryanair have the lowest CO2 emissions per kilometre travelled than any other airline". Last year, the airline launched a new environmental policy, in which it said it would offer its customers the chance to offset the carbon cost of their flights. The nine carbon emitters above Ryanair in the list are all power plants fired by lignite, which is a form of soft brown coal. The annual rankings are not a list of companies across Europe and how much CO2 they produce. Instead, they focus on 11,000 power stations and manufacturing plants in the 28 EU member states plus Iceland, Liechtenstein and Norway, as well as aviation activities in these countries. The EU says those activities have been chosen because they can be measured and checked with a high level of accuracy. Emissions have to be registered with EU authorities by the 31 March. Since 2012 the European Union has attempted to control aviation emissions through its Emissions Trading System (ETS), which started in 2005. The ETS works on the cap and trade principle. Under its scheme, a cap is set on the total amount of certain greenhouse gases that installations covered by the system can emit. Over time, the cap is reduced so that total emissions fall. Within the cap, companies can buy or receive emission allowances which they can trade with one another as required. They are also allowed to buy limited amounts of international credits from emission-saving projects around the world, with the limit ensuring that the credits have a value. Companies must give up enough emission allowances each year to cover all their emissions, otherwise they face heavy fines. The airline industry is also introducing its own initiatives. As a first step, the Carbon Offsetting and Reduction Scheme for International Aviation requires airlines to monitor and report their emissions from this year. The full scheme will start in 2021. The European Union says that without any action, CO2 emissions from aviation are set to grow by up to 300% by 2050. John Sauven, executive director of Greenpeace UK, told the BBC: "When the aviation industry talk about the necessity of expansion, always remember that a lot of their slots are reserved for short hops which can often be done just as easily by train." Climate change: Which airline is best for carbon emissions?